The view from my hood. • You have to learn to share. I’m not usually one to use if/then statements in this context, but if you make very little money, you’ll have to tolerate shared living. When you’re searching Craigslist, choose “rooms/shares.” I’ve found both places I’ve lived in Manhattan via Craigslist shares, and they turned into wonderful friends. I’ve always paid less than $1,000 in rent and utilities. You are the best judge of character regarding who you can and can’t live with, so I’ll leave the “make sure they’re nice” stuff for someone else’s blog. Beyond a safe/clean/healthy environment, if you have expensive taste or a bevy of neuroses/deal breakers, New York City living will be an adjustment. • Spend as little as you can on rent. Spend your money on experiences. (Plus, you won’t be home much anyway.) When you look back on your first 18 or so months here, you’ll get more happiness from the things you did than the countertops in your kitchen or the size of your bathroom. And, if you’ve been in Manhattan a year or so and the mood strikes you, by all means, move if you want to move. New York City is huge and there are tons of great neighborhoods! • Before you sign anything, ask about this stuff. The amount of light the place gets. The noise level from the street — on weeknights, early mornings and weekends. (Even if you don’t face the street, you’ll still hear noise.) The New York City Homicides Map. How close you are to fire stations, hospitals, police stations. Any construction projects on your street, and how long they may last. Pest problems, past and present. What the super is like. Heat/air and the flow or lack thereof. If you’re looking for a place and wondering about something specific, ping me on our Facebook page and I’ll give you my best answer! 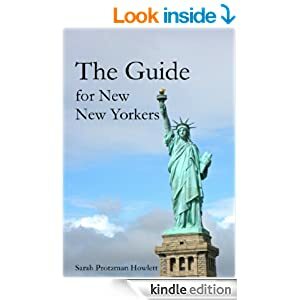 **My latest book, The Guide for New New Yorkers, shows newcomers how to survive and thrive in your adopted city, with advice on everything from apartment hunting and salary negotiation to meeting friends and avoiding debt. Want more insight into what it’s like to build a New York life from the ground up? Check out Two Years in New York City, a memoir in snapshots of 20-something New York life, written as they happened. What are neighborhoods that are cheap but also safe to live in? My husband and I are looking in Ridgewood, Queens for apartments for next spring/summer (maybe even this year if we can swing it). We’re looking at the side that overlaps with Bushwick for access to the L and M, plus the B52, B38, etc. to Downtown Bkln. It’s a beautiful, well-kept, diverse family neighborhood and an easy commute. Living further out, though, you either get stuck on the end of the M line or no lines at all, which is not so convenient. Queens is a bit tricky in that some parts have amazing train service, and some parts (like the suburb I travel to when I see my doctor, 12 bus stops past the very end of the J Train) have no trains at all. I’m from Europe, Slovenia and it has been my life long dream to move to NY city as soon as I would be able to go. And the time is coming – the next year I’m applying for the NYU and later on plan on getting a job and an apartment on Manhattan: But the thing is that because I am so far away, on a diffrent continent… The thing is I don’t know even one single person who lives in New York. So once I’ll be there, I will be on my own. And is that not good idea? And how will my life look like ? I mean, I’m only asking because up till now I’ve always imagined it the Carrie Bradshaw lifestyle. Is that just a fantasy, is tht a really unrealistic dream? my name is Alejandra im a 21 yr old from california. I’ve always dreamed of moving to new york, and i havent because ive felt an attachment to my family/school/ boyfriend etc.. here in CA. My parents are moving out of state after New Years, and that obviously does not include me. I’ve finally got my chance to move to NY to start a new life, with nothing to hold me back. The only problem is i don’t know anyone and don’t even know where to start. im scared to move to such big city without not knowing 1 single person and starting from 0 without the help of anyone.ive always depended on my parents, so this would be such a big step in my life. i am currently going to beauty school so i would probably transfer to one of the many school out there so i can finish and follow my passion in the big apple. if you can please help me out with ideas or advise on what to do. Why do so many people say “Cheap apartments don’t exist in the city”? Is it because they want to live on their own? I would probably get a roommate.. to make it easier.